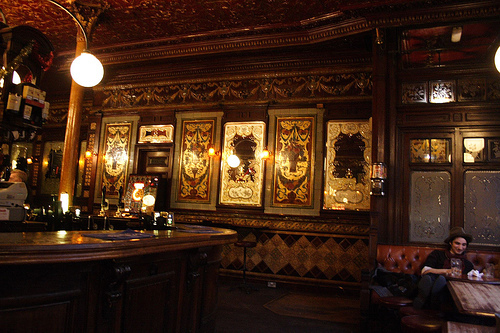 The Princess Louise is an exquisite example of a Victorian public house, just a stones throw from the British Museum and the West End. This drinking den is carved up into half a dozen individual bars around the horseshoe island bar, each separated by ornate wooden booths with frosted glass making for a uniquely intimate and exclusive feeling to the place – definitely one of my favourite pubs in London for novelty and atmosphere. Of course, the partitions originally existed to segregate drinkers of different social classes, but those days are long gone and this pub delivers Victorian architectural charm with comparatively cheap drinks for the area. The incredible detailing really is rare – from the ornately patterned tiling and engraved gilt mirrors, to the high stucco ceiling, this place is a true gem. It wasn’t always perfectly preserved. When Yorkshire-based brewery, Samuel Smith, decided to make the Princess Louise their flagship London pub, they decided to go all out and restore it to it’s former glory, rather than refurbish the space altogether. The results are priceless and a real testament to the original Victorian craftsmen who finished the pub in 1872. The pub is so historically valuable, even the men’s toilets are listed as protected heritage (not that I’ve been in there… just seen the pictures ;)! The bar now serves up the full range of Sam Smith’s organic lagers, bitters and ales with pints to go for just over £2. If you want to sample some ethical brew – this is a good bet. Peckish punters can also head upstairs to their first floor bar and hunker down into a leather sofa to sample of the bar menu. It’s a classic affair – no frills, but satisfying pub grub.